This is really just an excuse to share a picture of one of the best views I have ever seen. 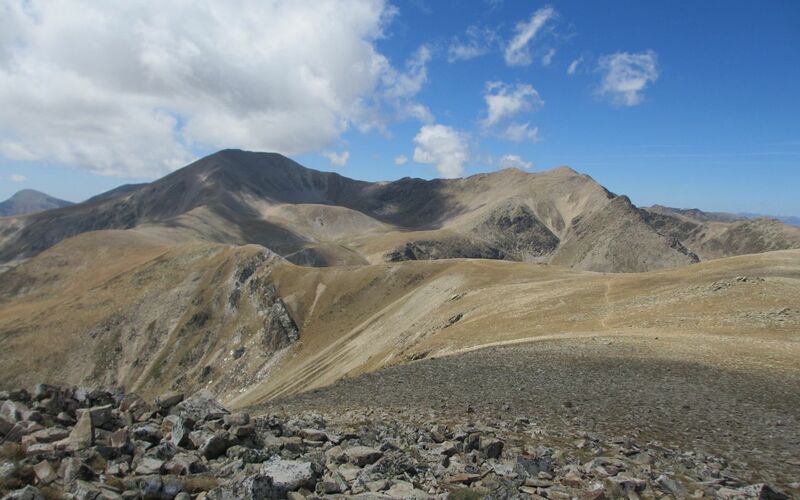 The Pic de la Dona is at 2704 metres in the Catalan Pyrenees above Ulldeter at the top of the valley of the River Ter which flows down through Campodron. This view is looking west towards the Pic des Bastiments (in Catalunya) and the Pic Bacviers (in France). It’s the highest point I’ve ever walked to, and the views in all directions were superb. Now, as the rain pours down in chilly Cambridge, it’s good to be reminded of sunnier times. We’ll be back in Collioure, though, on September 29th – I have been invited to play ‘Poussière d’étoiles’ (the French version of ‘Rocks and Stones’) at the vernisage (opening) of an exhibition of the work of Charly Devarennes, for whom I wrote the song. The exhibition will be in l’ancienne mairie, place du 18 juin, 66190 Collioure, France. This is an enormous privilege, and I am very moved to have been invited. I promise a future blog to say more about Charly.